if you're thinking about heading to Yanchep, you should organise it weeks in advance. There's just 1 hotel within 10 kilometres. Wotif recommends booking a room at the Yanchep Inn, as it's the only available hotel near the action. For some alternatives, try out the Clarion Suites Mullaloo Beach and the Novotel Swan Valley Vines Resort. They are located 30 kilometres and 35 kilometres respectively from the center. Further alternatives include the Joondalup Resort, 25 kilometres away, and the Joondalup City Hotel, 25 kilometres. After you've hung out in Yanchep for a while, explore Western Australia's many other offerings. Check out the art galleries. Nature lovers could also take in the region's beaches and desert landscapes. Travellers in this fabulous part of Australia enjoy hiking and four-wheel driving. The close by cities of Muckenburra and Marmion are worth exploring. Muckenburra is 20 kilometres to the north of Yanchep, while Marmion is 35 kilometres to the south. Hotels and apartments in Muckenburra are the Sandy Lake Farm - Abbeys Cottage and Sandy Lake Farm - Bed & Breakfast. Marmion options include the Hillarys Harbour Resort and Quality Resort Sorrento Beach. Get your sporting fix by taking a journey to HBF Arena, which is positioned to the south of Yanchep. Like to stay close by? The Wanneroo Villa Tavern and the Time in a Bottle may be ideal. Located 50 kilometres from Yanchep is Perth International Airport. Stay nearby at the Assured Ascot Quays Apartment or the Country Comfort Inter City Hotel Perth. How Much is a Hotel Room in Yanchep? 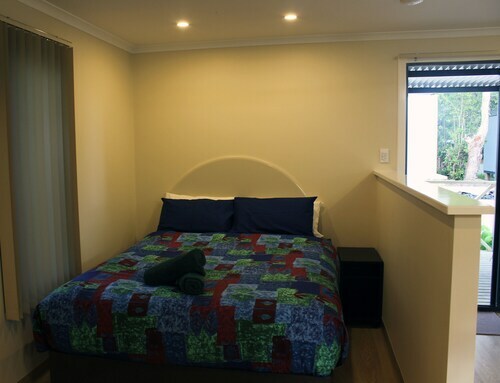 Hotels in Yanchep start at AU$95 per night. Prices and availability subject to change. Additional terms may apply. nice clean apartment. well sized for space and location to hillary CBD. Only issues was only living room had aircon not the rooms. Enjoyed our stay very much. The cabin was clean and tidy. In general, the park had a welcoming atmosphere and the surrounds were very clean and tidy. A pleasure to stay.